A Preview reception gives art lovers first chance to see and purchase original artwork and meet the artists. Come enjoy refreshments, live music and vote for your favorite for the People's Choice Award. Plein Air painters will also display their freshly painted works of scenes from around Llano at the party and offer them for sale. The reception runs 5:00-7:00 pm on April 29 and is open to the public. Plein Air Registration is open until Thursday, April 27. Click here for info and to register online. 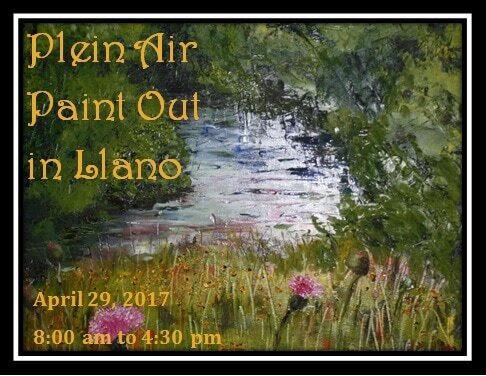 Painters will be out and about in Llano on April 29, when the Llano Fine Art Gallery will be hosting the Plein Air Paint Out in Llano. Plein Air means painting in open air and painters love to practice this technique for its use of natural light and the spontaneity of completing a painting on site. 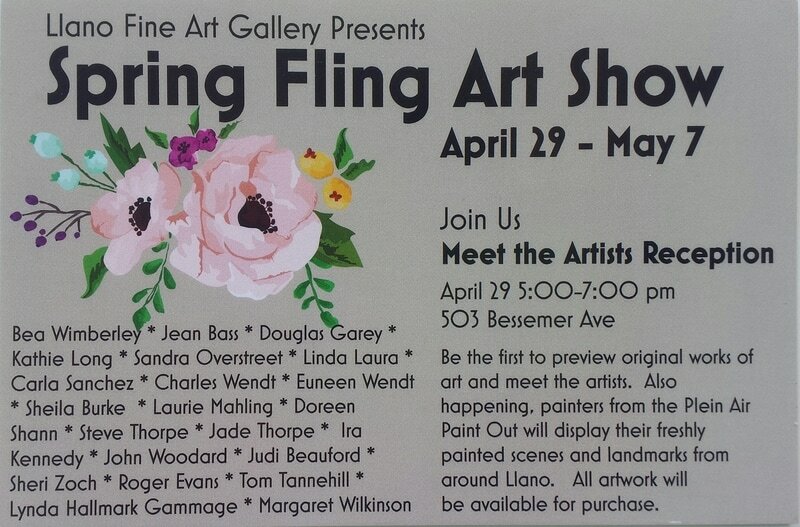 The event coincides with the opening of the Llano Spring Fling Art Show which runs from April 29 – May 7. Visitors to the juried art show will see over 30 original works of art from regional artists including some of Llano’s very own talented resident artists. Handcrafted works of jewelry, sculpture, pottery and glass can be seen as well as original paintings with a variety of subject matter.